How do I use the to-do list for all my courses in the List View Dashboard as a student? 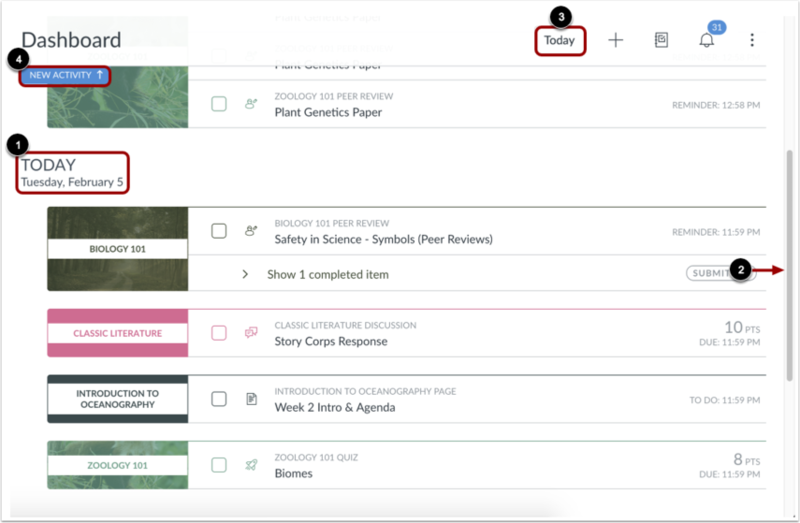 The List View Dashboard displays all course To Do items in an agenda view to help you easily manage tasks across all of your courses. The To Do list contains graded as well as any non-graded To Do items your instructor designates for a course To Do list. You can also add and view your own To-Do items in the Dashboard. The List View Dashboard does not account for course favorites and displays all items based on date, course ID, due date, and due time. 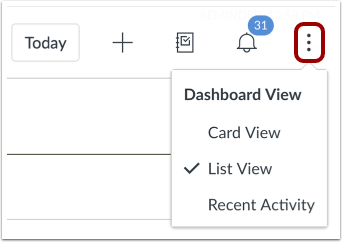 To-do items can also be viewed in the Card View Dashboard and the Recent Activity Dashboard. To open Dashboard List View, click the Options icon  and select the List View option . Note: Depending on your institution's settings, your dashboard may default to List View. The List View Dashboard defaults to the current date . To view previous and future dates, scroll up and down the page . To quickly return to the current day's To Dos, click the Today button . To quickly access prior items with new activity, click the New Activity button . When multiple courses include To Do items on a single date, courses are listed by Course Name and items are are listed by due time . Graded items display the point value for the graded item . To access a To Do item, click the item name . To view the home page for a course, click the name of the course . List View includes labels and icons to quickly communicate an item's status and activity. Once a graded item is past the due date, the item displays a Missing indicator  and a Missing label . Missing items submitted after the due date display a Late label . Graded items are automatically marked as completed once they are submitted. Non-graded items must be manually marked as completed. To manually mark an item as complete, click the checkbox for the item . When you manually mark an item, the item's status will update when you refresh the page. Completed To Do items remain in the To Do list for you to view at any time. To view information about completed To Do items, click the Show completed item link . The completed items display a completed checkbox . To view completed item information, click the item name . The next time you refresh the page, the completed items will once again be hidden within the completed link. To view a list of graded past-due items across all your courses, click the Alert Menu button . 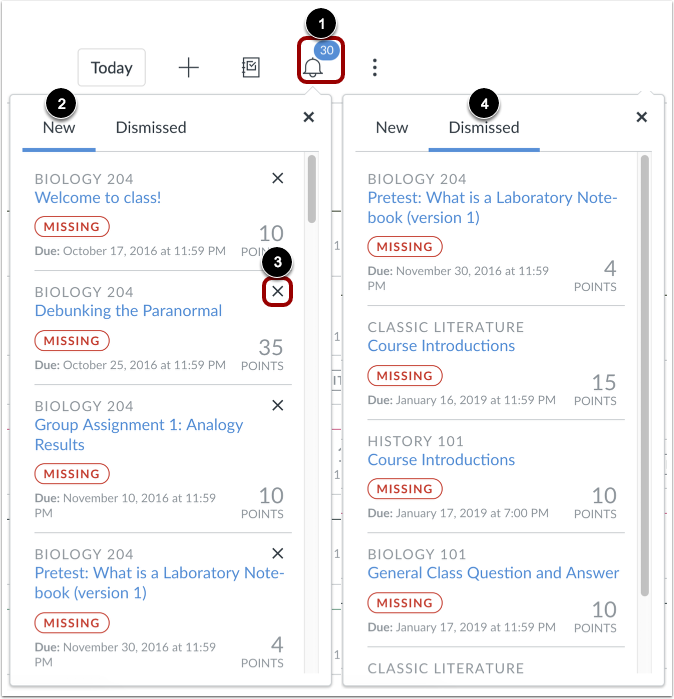 The Alert menu helps you see what opportunities are available to you to improve your course grades. To view new alert items, click the New link . You can dismiss new alert items by clicking the Remove icon . Dismissing a new alert item does not affect its status or mark it as completed. To view dismissed alert items, click the Dismissed link . To view your current course grades, click the Gradebook icon . The My Grades menu displays your current course grades . Click the course name link to view the Grades page for your course . Note: If one of your courses uses grading periods, the grade displayed is the grade for the current grading period. You can add your own To-Do items to the Dashboard. Items associated with a course display as part of the course items and arranged by due date . General to-do items always display below all courses . To-do items can be edited at any time by clicking the Edit icon . To add a To-Do item, click the Add Item icon . Note: You can also use the Calendar to add to-do items, which will also display in the List View Dashboard. To change the Dashboard view at any time, click the Options menu. Previous Topic:How do I view my favorite courses in the Card View Dashboard as a student? 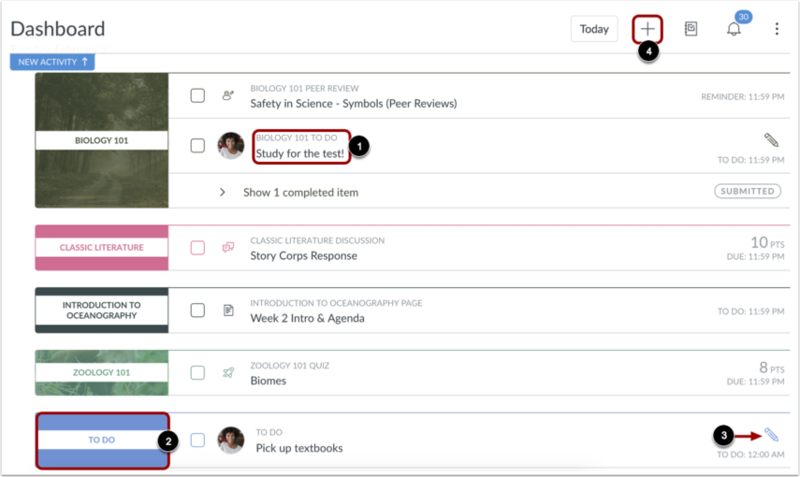 Next Topic:How do I add a to-do item in the List View Dashboard as a student? Table of Contents > Global Navigation > How do I use the to-do list for all my courses in the List View Dashboard as a student? Re: How do I reset my to do list in order to see to do items I've hidden?